Lim Wei Yi is smart, committed and driven. He scored 8As for his PMR and he will probably outscore everyone in his SPM as well.He was named ‘Tokoh Sahsiah’ (Exemplary Student of the Year). His teachers praise him for being hardworking and committed. 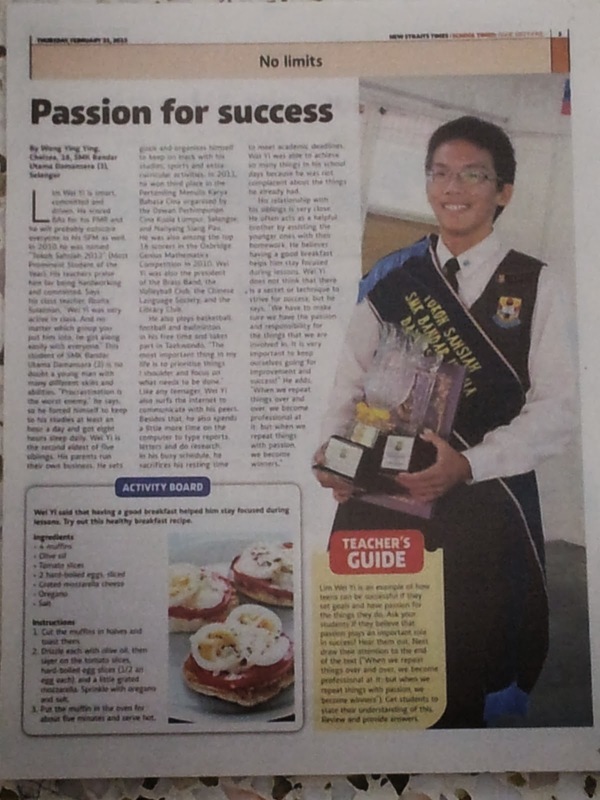 Says his class teacher, Puan Rozita Sulaiman, ‘Wei Yi was very active in class; and no matter which group you put him into, he got along easily with everyone.’ This student of SMK Bandar Utama Damansara (3) is no doubt a young man with many different skills and abilities. ‘Procrastination is the worst enemy one could have,’ he says, so he forces himself to study at least an hour a day and get eight hours sleep daily. Wei Yi is the second eldest of five siblings. His parents run their own business He sets goals and organizes himself to keep on track with his studies, sports and extra-curricular activities. In 2011, he won third place in the Pertandingan Menulis Karya Bahasa Cina organized by the Dewan Perhimpunan Cina Kuala Lumpur, Selangor and Nanyang Siang Pau. He was also among the top 16 scorers in the Oxbridge Genius Mathematics Competition in 2010. Wei Yi was also the president of the brass band, the Volleyball Club, the Chinese Language Society, and the head of the Media and References Subunit in the School Resource Centre Prefect Board. He also plays basketball football and badminton in his free time and takes part in Taekwondo. ‘The most important thing in my life is to prioritise things I shoulder and focus on what needs to be done.’ Like any teenager, Wei Yi also surfs the Internet to communicate with his peers. Besides that, he also spends a little more on the computer to type reports, letters and do research. In his busy schedule, he sacrifices his resting time to meet academic deadlines. Wei Yi was able to achieve so many things he already has.